Dementia’s about real people, and for me, whatever the minutiae of policy aims in cure, care, research and dementia inclusive communities, I feel it’s all about hope. As I was in a cab going from North London to West London, the radio happened to be on. And up popped Jayne Goodrick for National Carers’ Week for the Jeremy Vine show on BBC Radio 2. http://www.bbc.co.uk/programmes/p02sxhl5/player There’s no escaping from Jayne sometimes for me, in a completely good way. 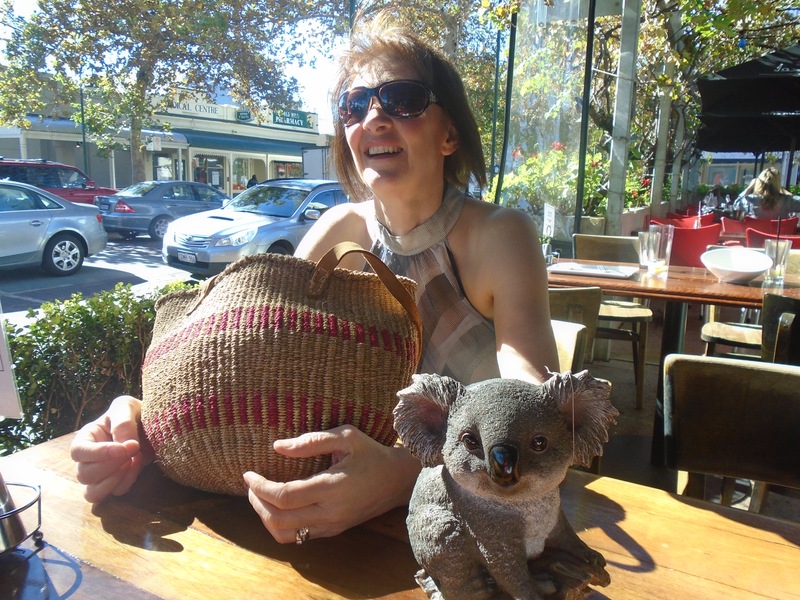 I can honestly say I had a koala of a time when we all trekked off to the Western Australia for this year’s Alzheimer’s Disease International conference in April. Here’s Jayne with the ceramic koala I later gifted Kate Swaffer. Jayne and Chris made it from Rhudlan, Wales, setting off at 4 am. Despite that Jayne looked very spritely and incredibly excited about the event. And actually yes – we are still buzzing about this event, as it’s got a great atmosphere. It hasn’t got the stuffiness that you can sometimes get – it just has people who want to spend time with each other. The first thing you can be reassured about is the fact you’re at the right venue; not least as it’s a bit of a ‘who’s who’ in dementia care who turn up (very famous people from Twitter who all share a common interest in living with dementia and caring). My only complaint about the ‘dementia friendly’ nature of the venue is that the numbering around the stalls was not at all systematic, very disorienting, and should be rationalised in future. The first thing to say is that the programme for anyone with a passing interest in the lived experience of individuals following a dementia diagnosis, issues relevant to carers, domestic or international policy, will love this conference. The talks in a diverse and detailed programme were invariably packed, and delivered to an exceptionally high standard. 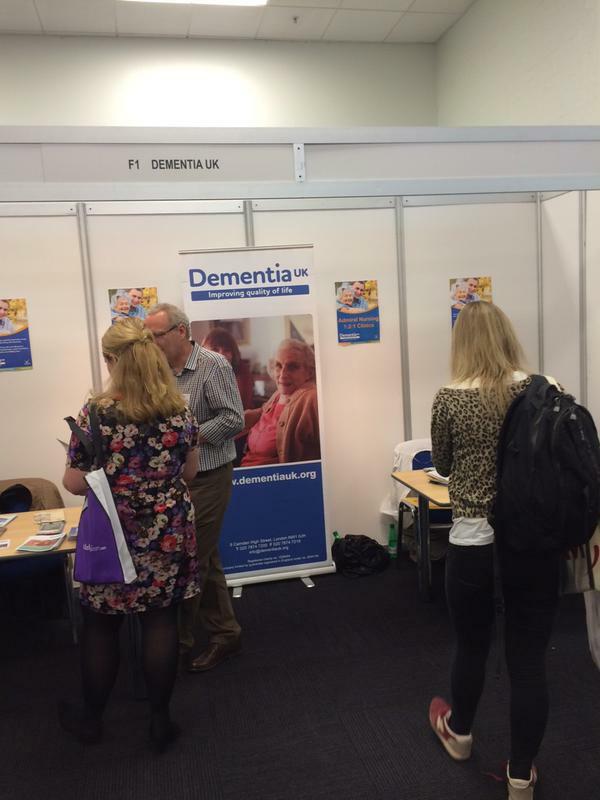 It is remarkable that this event is so inexpensive compared to normal conferences on dementia; this is because the emphasis is not on selling products to commissioners who can get paid to go to such events from local budgets, to grease the cogs between commissioners talking to other commissioners, or journalists oiling whom they perceive to be ‘key stakeholders’. The emphasis instead is completely on the people who matter: people with dementia, carers and especially family and friends who become vicariously engulfed into this world. I’m not a huge fan of West London, to be blunt. But everytime I’ve even to London Olympia, it’s been incredibly well organised, and people there very helpful. 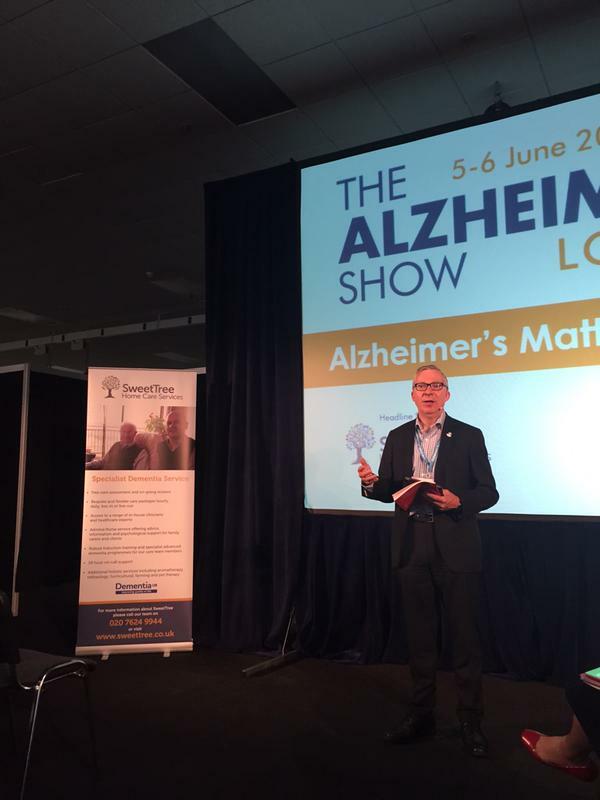 The first person who greeted me at the Alzheimer’s Show was Marc Wortmann, CEO of Alzheimer’s Disease International (ADI). 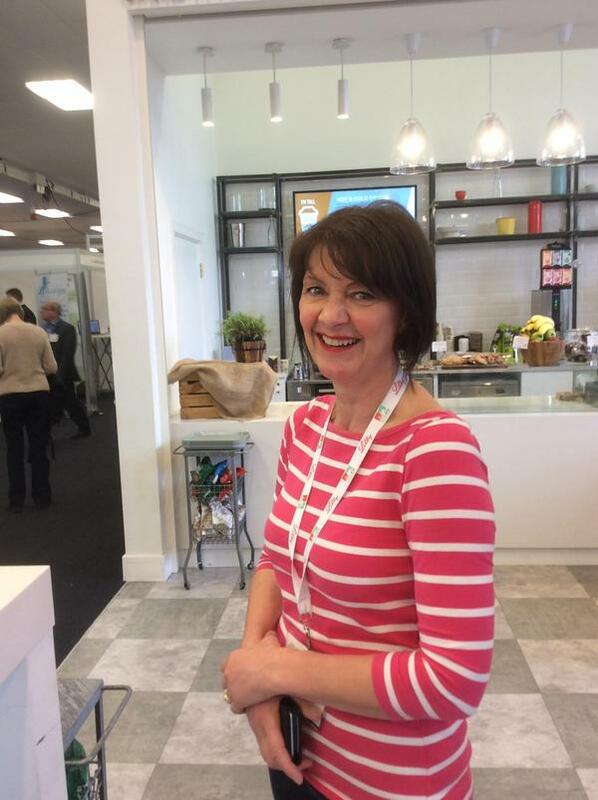 And of course the first thing that Marc told me me about was the groundbreaking report from the ADI on “Women and Dementia” and that Dawn Brooker would be presenting the findings at lunchtime. 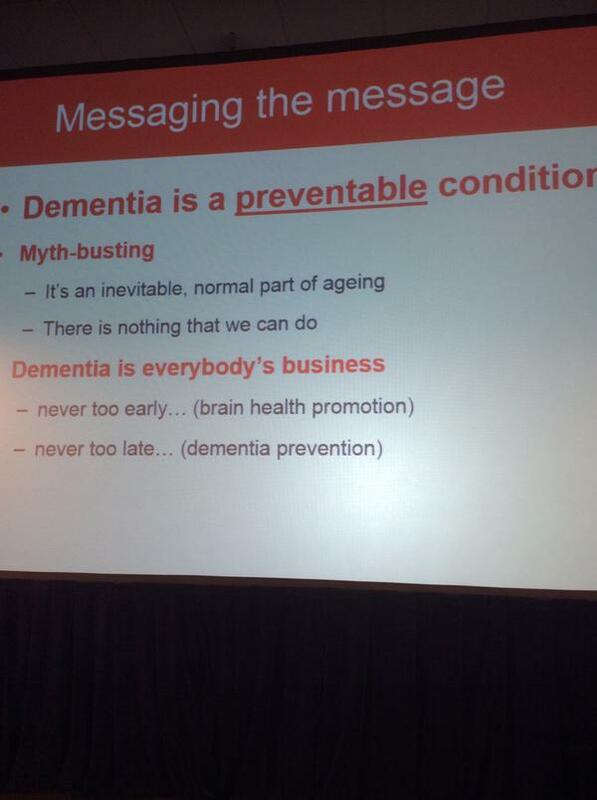 I did in fact go as advised; it was a fascinating talk; and made me conclude (like I did for Prof Martin Prince’s talk that we must have these seminal findings seeming their way into the national plans for dementia). 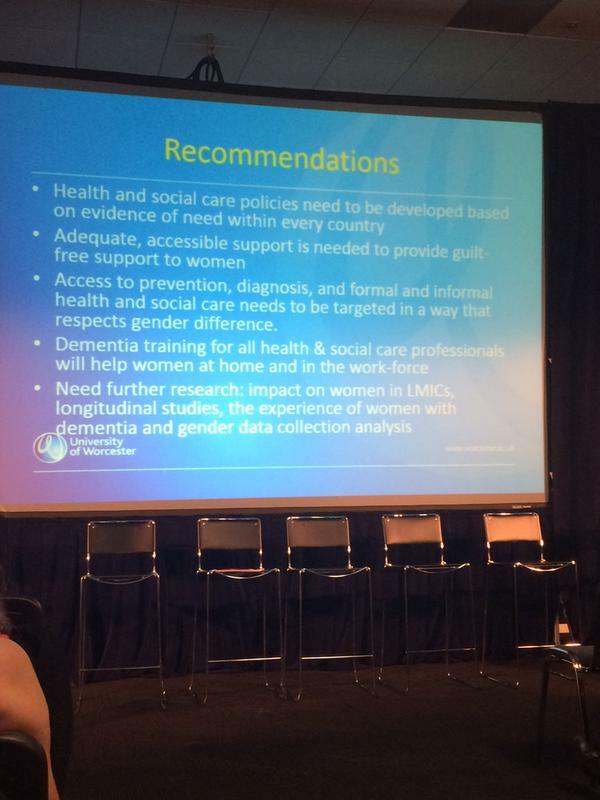 The policy plank that is ‘women and dementia’ is incredibly important for a number of reasons. I should let you read the reports for yourself. And it’s not just the ADI who’ve had a crack at this. I had a long chat with Nada Savitch whom I think is brilliant. Involved in ‘Innovations in dementia’, Nada is really not interested in any of the stuffiness which can accompany working in the dementia field. Her primary interest in learning off people who’ve been given a clinical diagnosis, and carers, often family members, what makes them tick and what they want; and likewise has contributed much herself on understanding women and dementia. 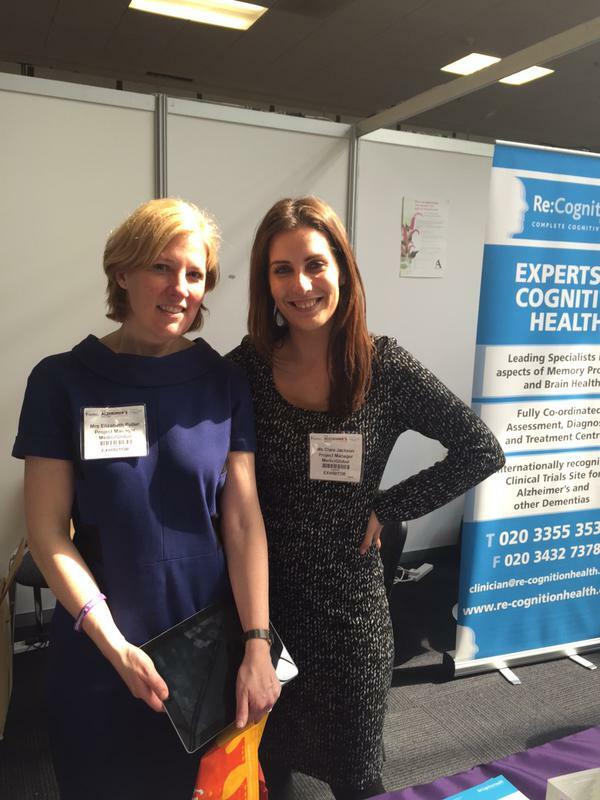 Likewise, Beth Britton, who last week was at a Macintyre Charity event (this charity has a particular interest in intellectual difficulties), is also very interested in promoting issues to do with women and dementia, anyway. I’ve got a habit of turning at events in England and around the world where @KateSwaffer will suddenly spring up on a slide or overhead. And yesterday was no exception. 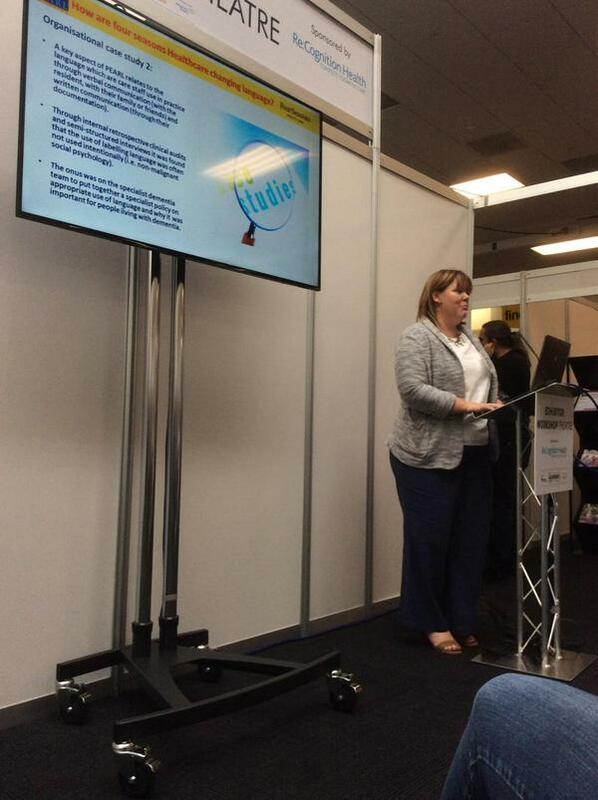 Here’s Kate being mentioned by Prof Dawn Brooker. And here is Kate again on the @AlzDisInt twitter feed. The findings of the report are truly remarkable, and I do commend them to you. 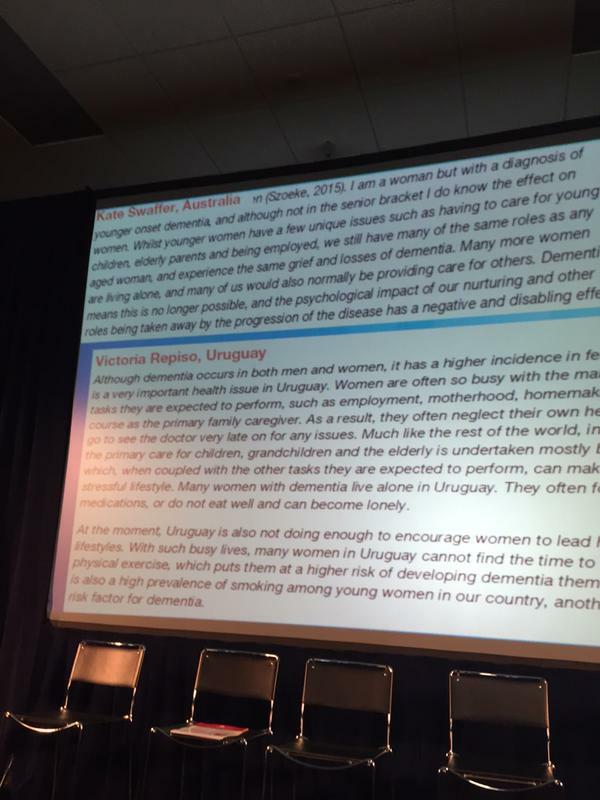 Across all regions of the world, dementia disproportionately affects women. It turns out more women live with dementia than men. The prevalence is higher for women than for men; women are more at risk of developing dementia and the symptoms they live with are more severe. Women provide a substantial proportion of informal care to people with dementia, with around two thirds of primary caregivers overall being women; and this figure is significantly higher in LMICs, areas which will account for 71% of the global prevalence of dementia by 2050. 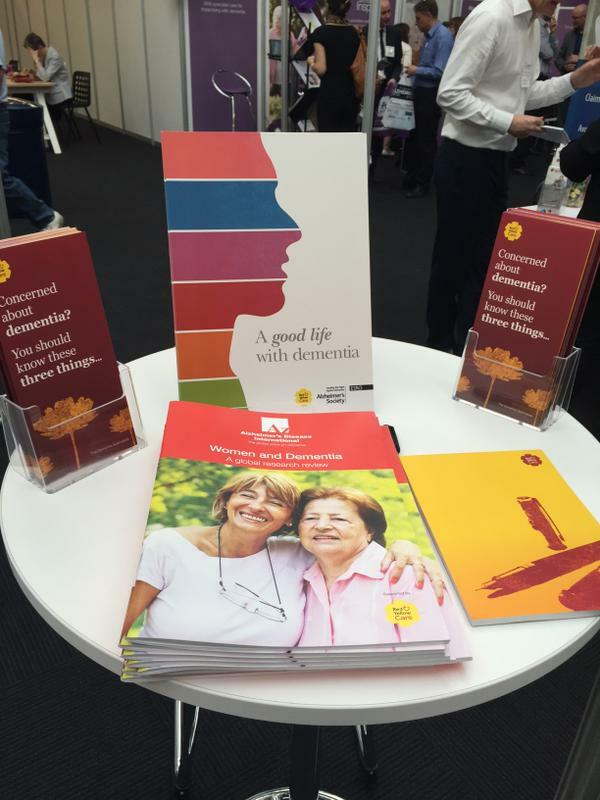 There were numerous hard copies of the report made available on the “Red and Yellow Care” stall. Earlier this week, in the NHS Confederation, Duncan Selbie of Public Health England discussed why public health was an unique policy offering, but how it was essential to make it integrated as a concern of whole policy. This indeed is especially true in dementia. I agree entirely with Jeremy Hughes that, parallel to developments in symptomatic treatments, a major line of avenue must be prevention. I find the prevention area difficult, as it is well known that there have been very learned people who’ve developed dementia (such as Iris Murdoch), but the policy discussion needing to be had is an important one, as prevention of illness, health and wellbeing is part of the national narrative, and comes up in an analysis of non-modifiable risk factors. Inevitably, it’s hard to sit through talks feeling very hypoglycaemic. 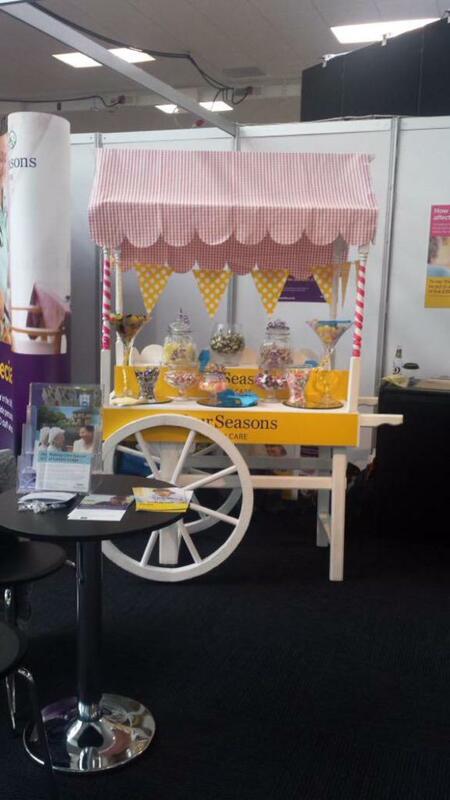 It is however extremely helpful to have tweets which display conveniently sweets dotted around the event, together with bay numbers. Here was what I spent ages hunting for, from Four Seasons; I would have got there sooner had it not been for the clumsy numbering of the booths. Joanne Agnelli gave a brilliant talk which touched on a number of key policy issues. I caught Joanne, Gary Mitchell and Jessie McGreevy in the morning who were all buzzing with sheer joy. Here’s Joanne. 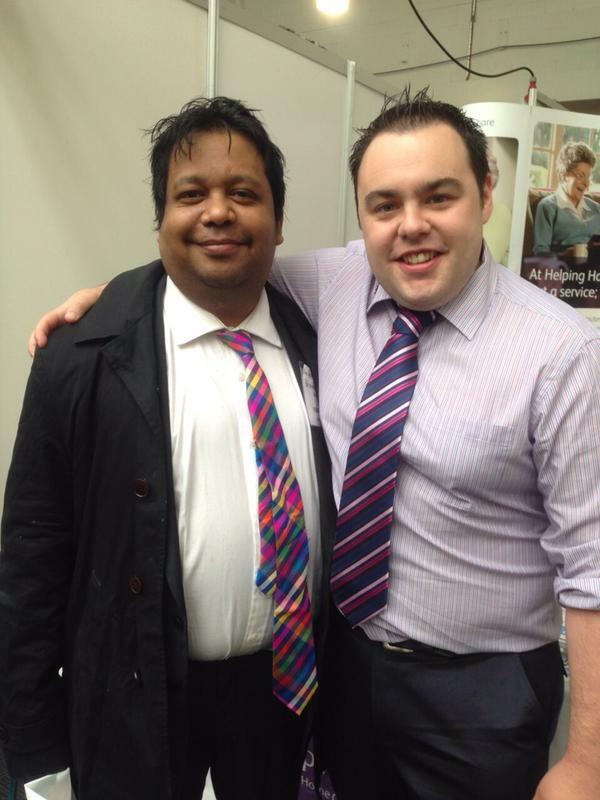 Here’s a ‘cheesy shot’ of me and Gary. Ironically, the second person to find me was Chris Roberts. We’d effectively travelled all around the world to re-convene again in the Mini-Australia, that is West London. 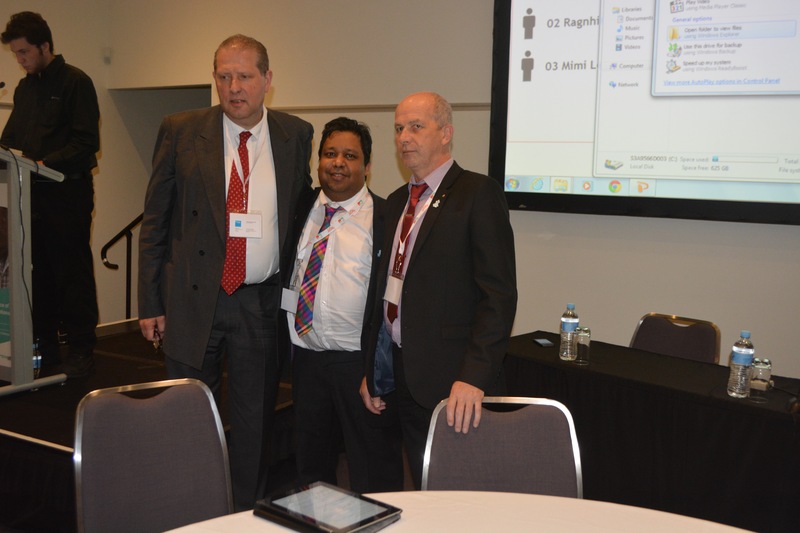 Chris in Western Australia had been speaking about his lived experience of dementia, having been diagnosed in his late 40s with mixed vascular and Alzheimer’s dementia. But he also speak of the importance of research in dementia (both in national and global policy), how it had inspired him to campaign on better research. Chris is one of those people who believes that high quality into care is important, like treatments for better symptom control; and that research is pivotal for this. I was on Prof Martin Rossor’s firm once upon a time at the National Hospital for Neurology and Neurosurgery; and of course Prof Rossor is now national clinical director for research in dementia for NIHR DeNDRoN. 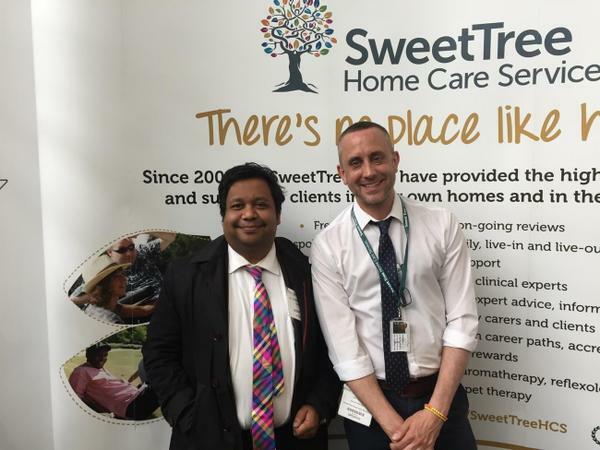 And I loved dropping by the Sweet Tree stand who are seeking to coproduce sustainable services with Admiral nurses, which I think is a very good thing for an extended care ecosystem involving care homes. 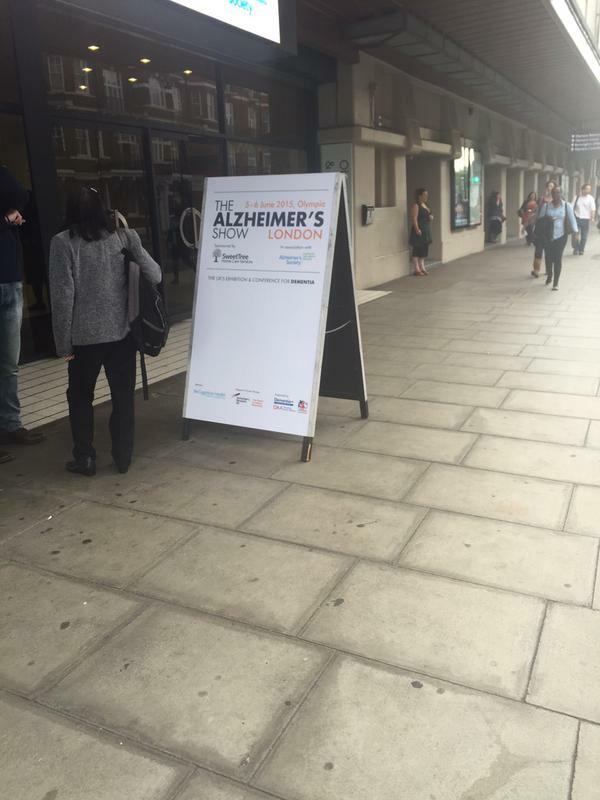 This was a theme that Jeremy Hughes, the Alzheimer’s Society Chief Executive who has had a remarkably successful time in putting dementia ‘on the map’ for both national and international policy. The Care Quality Commission (CQC) has reviewed the experience of people living with dementia as they move between care homes and hospitals. Andrea Sutcliffe, CQC’s, Chief Inspector of Adult Social Care, highlighted the findings from the seminal ‘Cracks in the Pathway’ report from October 2014, and explained how regulation can inspire improvement in services. In my experience, it is all too easy for the clinical regulators to get deeply engrossed with ‘process’ losing an ability to see the “wood from the trees”. That’s why I feel that going back to what the public want off the regulator is essential. Andrea described a simple ‘Mum test’, which broadly speaking is that if the services are good enough for your Mum they should by and large be good enough for most reasonable members of the public. 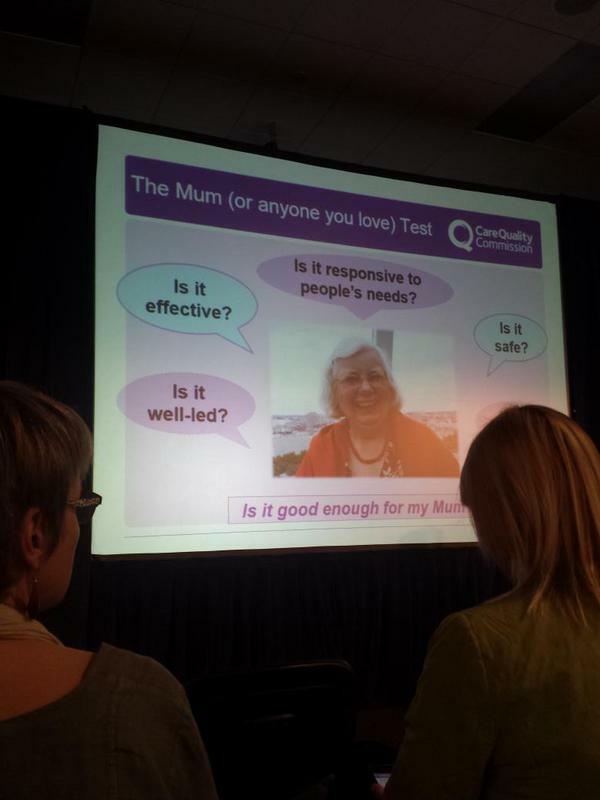 The CQC are in the unenviable position of rating care facilities across the whole range of performance, and there was a real sense that the CQC were not simply a ‘hit and run’ organisation that would produce damning criticism of providers, but also sought to signpost how care could be improved. 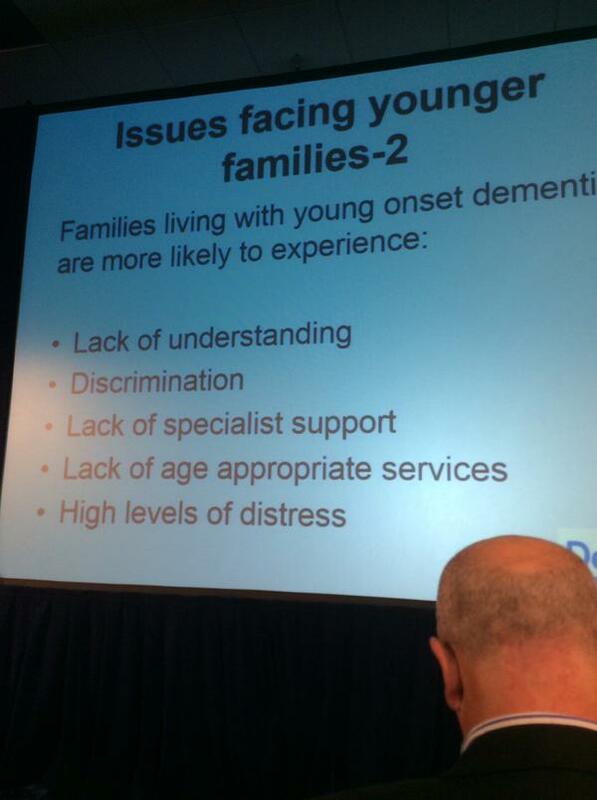 In a question and answer session, I asked what the panel thought were the greatest ‘barriers for care’. Dr James Warner, lead for old age psychiatry at the Royal College of Psychiatrists, was definitely ‘singing my tune’ when he referred to care being like 24 separate doors that you knock on but with no central coherence. Jeremy Hughes later said that for him it seemed that it was like knocking but not knowing for certain they were even front doors. Andrea Sutcliffe, a key person in a critical clinical regulator, said there were three major barriers in her experience: silos, stigma and secrecy (but then gave excellent explanations as to how to mitigate against all of them). 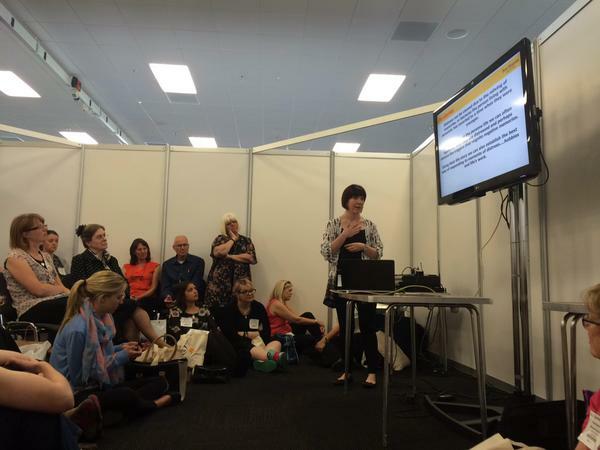 Anyway, the panel at the #AlzShow had much better success in achieving what the #Confed2015 (NHS Confederation) earlier in the week had not been able to achieve: diversity in the panel (but not yet ticking the disability or BAME “boxes”). Jeremy emphasised that different charities would do different things for different people at different times of their dementia. Helga Rohra, chair of the European People With Dementia group, often refers to ‘faces of dementia’. Like Al Power, she rejects the ‘stages’ of dementia approach, not least because it is an inaccurate overly medical perspective. Likewise, it’s fair to say dementia advisors do different things to Admiral nurses, a type of clinical specialist nurse provision by @DementiaUK. 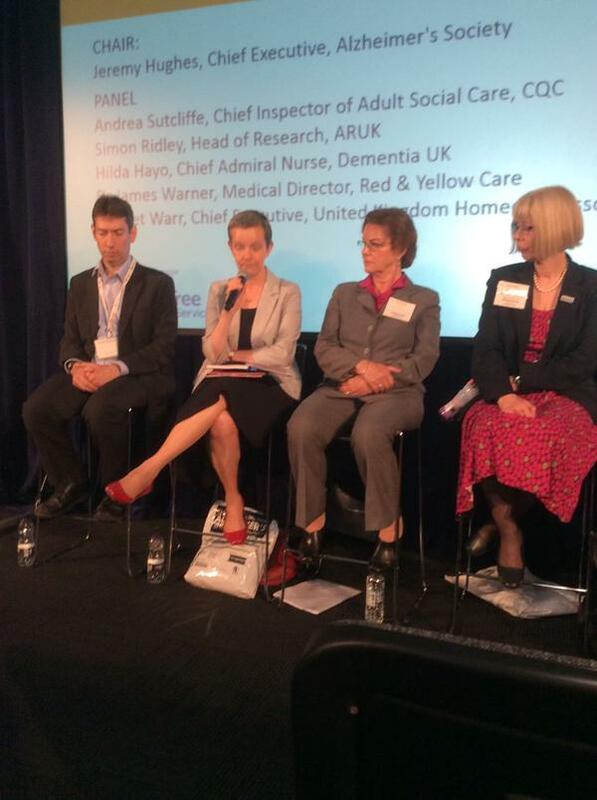 Hilda Hayo CEO @DementiaUK and chief Admiral Nurse, further emphasised the need for ‘collaboration’. Hilda Hayo was especially good on the unmet needs of younger families where there is someone who’s received a diagnosis of dementia. Hilda’s conclusions are broadly similar as mine, not that surprising as Hilda is finishing off her doctorate thesis on behavioural variant of the frontotemporal dementia. That indeed was the subject of mine, supervised by Prof John Hodges at Cambridge, so I inevitably spent some time evangelising about my own research with Hilda. Later today (Saturday), at 10.45 am, I will be speaking about my work under the guise of ‘Meet the authors’. This probably won’t be as interesting at Nick Higham’s version on the BBC but I will explain what I have tried to do in explaining domestic and integration in living well with dementia suitable for the general public; with of course has an emphasis on high quality research of key stakeholders, inclusive communities, “integrated” and “whole person care”, and the views of people living with dementia. As such, my books continue to be read and discussed by people living with dementia, and I hope the second one further contributes to a national debate (description here). 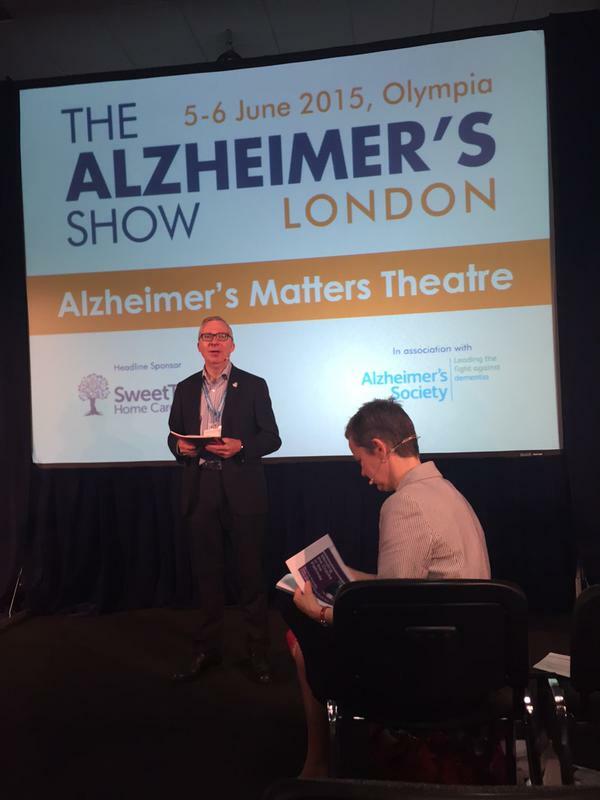 I’ve loved the Alzheimer’s Show – all 50% of it so far. Thanks hugely to Nigel Ward and staff for bringing it together. 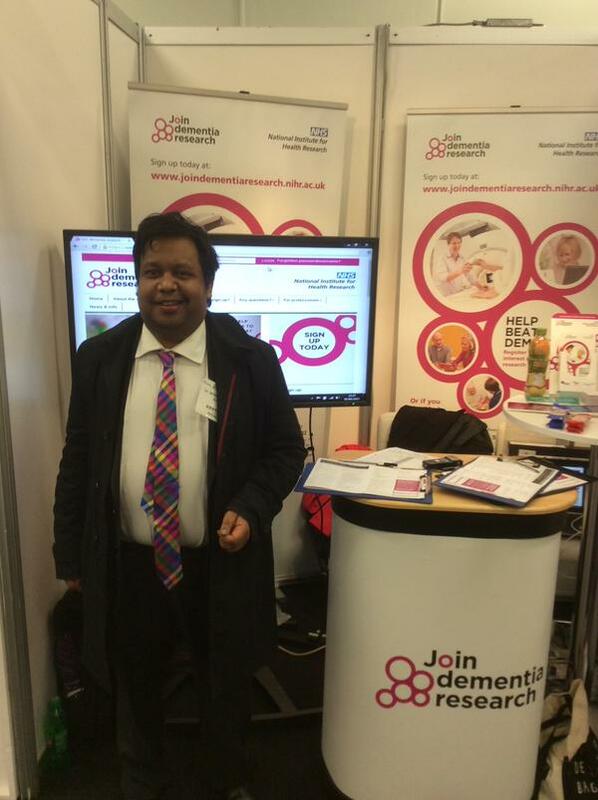 It’s a really special event to the many of us who are really devoted to English dementia policy. This year I, like Gary Rycroft, got a real feeling that there was more interest than ever, which I supposed to be expected as a ‘lag effect’ after the Prime Minister’s Dementia Challenge. As Jeremy Hughes argued, one advantage of having the same Prime Minister is that the Prime Minister will be forced to assess the efficacy of his own policy promises. But there is overall a sense that all this stuff is ‘work in progress’, and I think we’ve coming a huge distance to not that long ago when I launched my own first contribution, “Living well with dementia: the importance of the person and the environment”.